Everyone knows there's nothing better than a golden piece of #content. Okay, maybe not everyone. Still, there's no denying we live in a curated world. We're surrounded by content opportunities. A colorful wall. A neon sign. The lighting at golden hour. Like it or not, we live in a world that nearly treats content as currency. In said world, brands should build themselves head-to-toe around consumers' insatiable cravings for content. From sneakers to cookbooks, consumers expect and require products to be Instagram-ready. Consumers use Instagram pages as lifestyle moodboards and brands should, too. But of course, that's old news. Now, there's a catch. It's all about instant gratification. We all knew Instagram Stories wasn't just created to compete with Snapchat. But since its birth, users have struggled to differentiate the platforms. Even early-adapting bloggers have posted the same Stories on Snapchat and Instagram. The real trailblazers for Instagram Stories have been the media and brands, themselves. This is the first time brands and media have dictated social strategy rather than following in the footsteps of their consumers. Brands and media are onto us. They know what we want. And that's #content. Take it from online fashion and style destination, WhoWhatWhere (above). Their Instagram Story walks us through what would have previously been a Buzzfeed-style listicle. 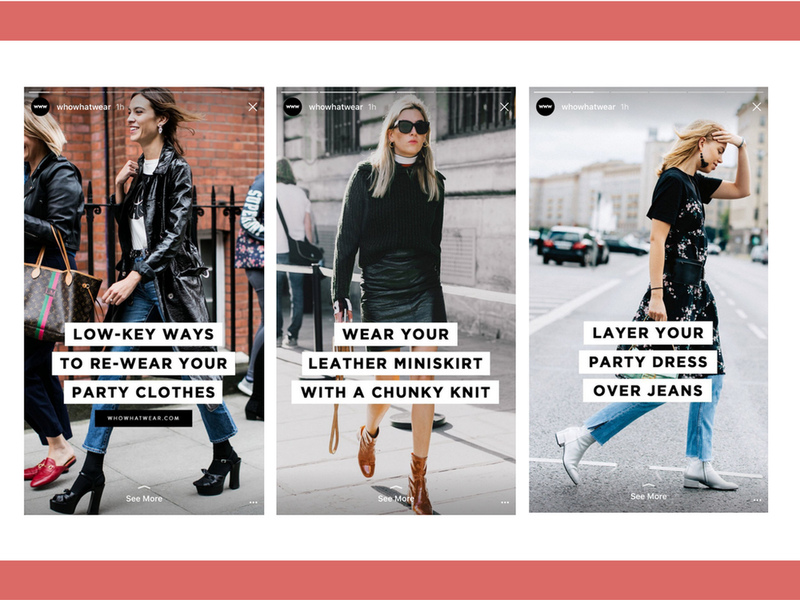 Instead of pushing "21 Ways to Re-wear Your Party Clothes," they brought their content right to the users' fingertips. Style meets lifestyle on Man Repeller's quippy-worded site, and their Insta Story is no different. In fact, they utilize the "See More" tab to lead viewers to full articles on their site. This feature is especially interesting because the easy Instagram-to-site transition presents a new opportunity for online sales.